Well… I didn’t manage to hit my target for March – I have a squad almost done, but they need a couple more sessions to finish them so I have to concede defeat. It sounds easy right? Paint 10 blokes in a month? March has been hectic – work, study, family visits… painting time has been squeezed out, but if I’m honest, I’m also bored with painting the same thing over and over. Time to mix it up a bit, but more on that later. But… next turn he managed to thread a Demolisher shot through some heavy terrain and wrecked out 2 Manticores and a mortar section… The Emperor moves in mysterious ways. Anyhow, great game – tons of dice, maximum carnage, thoroughly enjoyable. Last night I had a cracking match-up against my pal Jim and his Salamanders – a game long in the planning, but that kept getting cancelled. We were a bit late starting (my fault), so we just went for kill points. Now… Jim is a bit good, and he has bossed me a number of times in the past, so I knew I had to play well to be in it. I went for a compact force of 2x vets in Chimeras, CCS in Chimera, a Manticore, my Tripod-Knight and a couple of Plasma Sentinels. I also packed in a Culexus and a Primaris Psyker. Jim also had a Knight, a couple of drop pods with small squads (1 sternguard I think), a DS assault squad, Vindicator & Razorback, a Stormtalon, a small tac squad, a Vindicare and some scouts. I set up first and Jim stole initiative. SM turn 1: The first drop-pod arrived and chucked out a nasty looking squad right on target in my back-line, while the knight and tanks pushed forwards on my left & centre respectively. 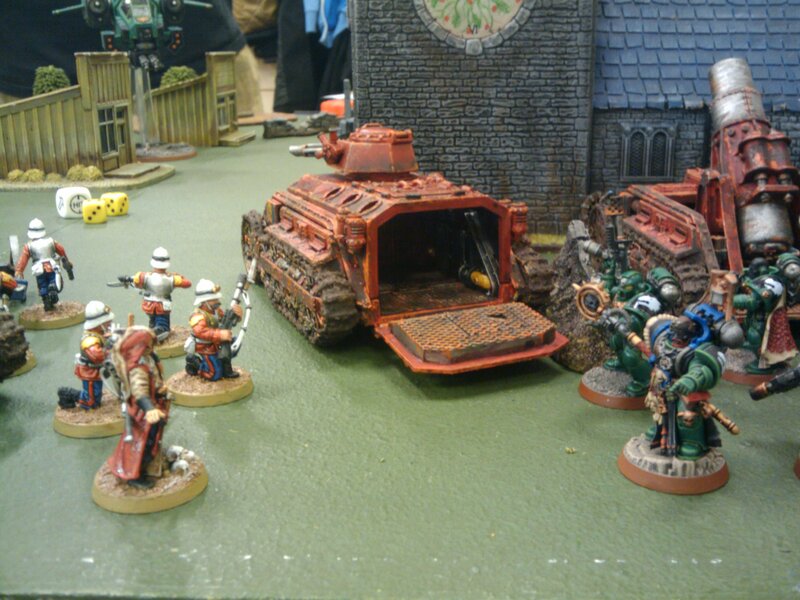 Shooting was fairly uneventful – the Vindicare tried to ace my command Chimera but whiffed, the drop-pod marines pegged a wound off my Culexus, and the knight immobilised my Plasma Vet’s ride. Something also took out the Plasma cannon on one of the Sentinels. SM turn 2: The Stormtalon and the Sternguard drop-pod arrived from reserve on this turn – again, bang on target. Everything else advanced and fired where it could. My Plasma Vets took the brunt of the Sternguard’s ire, losing half the squad and the Primaris Psyker to bolter and flamer. A small tac squad bundled out of the razorback and advanced on the Tripod – melta guns at the ready. They hit the towering construct, but either failed to pen or got stopped by the shield. The Marine Librarian (also the warlord) conjured a melta blast to take out the immobilised Chimera but missed, and lost a wound to Perils in the process! The Knight put the hurt on the command Chimera forcing the CCS to disembark, while the Stormtalon tried and failed to hurt my Tripod. The remaining Marine in combat with the Culexus died, and the assassin began to stalk her true prey – the warlord librarian! Marine turn 3: The Marine assault squad arrived from reserve, but suffered a mishap and went into ongoing. The enemy Knight bore down on the CCS, tagging them with Heavy Stubber fire before firing into the Manticore with the big melta jobby. This scattered a little and exploded the Manticore and the second drop-pod. The Culexus and damaged Sentinel were caught in the resulting blast. Yikes! The Knight charged the CCS and wiped them out with ease, slaying my warlord in return. The Stormtalon flew over my Melta-Vet Chimera, doing some damage on the way past, while the remaining marine got a grip and hid behind a building. Jim remembered that he had some Scouts on the board, and slotted a plasma-vet as an afterthought. My turn 3: My Tripod began stalking Jim’s knight, and managed to strip another HP off but failed the charge. My melta-vets jumped out of their ride, and managed to snap a couple of shots on the Stormtalon. Unfortunately I only managed one HP and a destroyed weapon, but still a pleasing result. There were a few other pot-shots here and there but nothing of note. Marine turn 4: The Knight marched towards my Tripod, firing as it went but to little effect. The Stormtalon began to hover and tried but failed to finish off the Melta vet’s Chimera, while Jim’s assault squad finally arrived and hammered the Melta Vets themselves – killing eight of them. I think Jim got a bit trigger happy because he neglected to disperse the assault squad before opening fire… Meanwhile, the Knight charged into combat with the Tripod – we both managed 2 D-weapon hits, and rolled on the boom-table. I only managed to do 2 HP’s on the Knight, (crap), but Jim rolled well and stripped all 6 HP’s off my Tripod. The towering machine exploded, which caught the Knight, which thankfully exploded too… Kaboom!! Epic showdown? Check. My turn 4: My final turn saw my 2 remaining melta vets drop the hovering Stormtalon, while my last Plasma Sentinel placed a perfectly aimed plasma blast on the newly arrived (and completely bunched up) assault squad, killing them all. 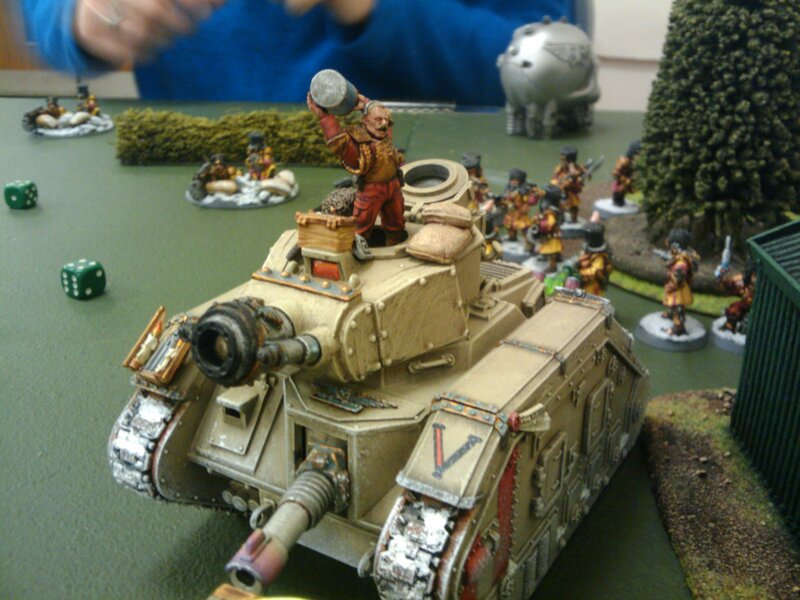 The last act of the game was my remaining Chimera trying and failing to slot the tac-marine. We were out of time, so game over! So, after totting up the score, we figured that Jim had finished ahead by 1 point… that is by far the closest I have been to catching him, (he is a bit good remember!). I’ll admit that I was momentarily disappointed to be so agonisingly close, but hey, it was an awesome game and we both had a load of fun playing it. But… just for the record – I had a Sentinel, a Chimera, and about 6 or 7 vets left alive, while Jim had 1 tac Marine, a scout squad and 2 immobilised and weaponless vehicles… I would have really really liked to go a couple more turns… Next time Jim!! 1: I ignored the drop-pod with the destroyed weapon – stoopid mistake, because that gifted Jim a VP for Line-breaker! 3: Forgot to fire the Manticore in turn 2… yeah… Noob mistake – I just got all excited about charging my Tripod! 4: Taking the Manticore was a mistake – it didn’t do much and is not the best tool for small & fast elite armies… 170 pts wasted. I would have been better off with a Vanquisher and a few ratlings for line-breaker! 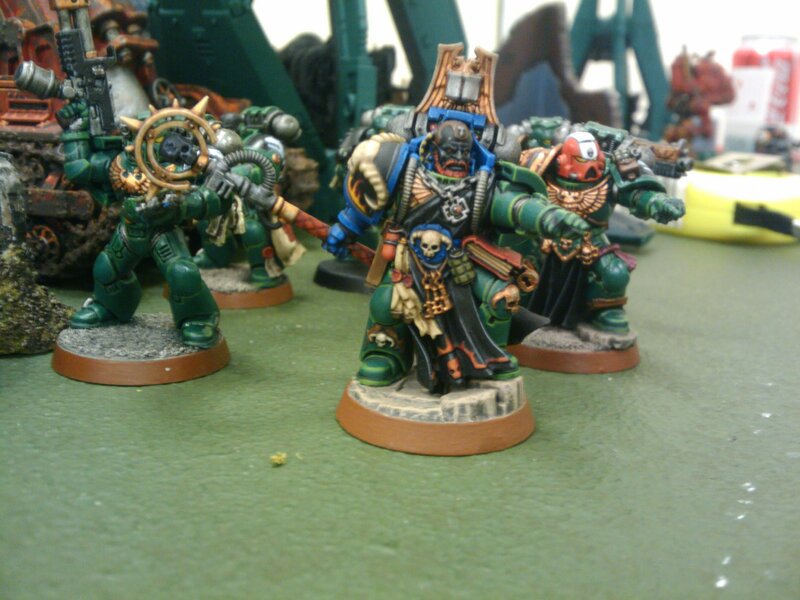 5: The Culexus did really well, easily accounting for 10 Marines and a Librarian. Shame she got caught in the blast from the Manticore! 5: Mo Tanks Muther Hubber!!! Whadda you guys think? Drop me a comment and vote for what you want to see next! Of course, there is always the stunning new AdMech from GeeDub… That’s a post all by itself, (but already perfectly articulated by Wudugast in my humble opinion…) Oh, and Salute is coming up too… and an Easter hiking trip with my kids… and it’s my 40th Birthday… *sigh*… busy busy! Peace out Brothers – until next time! Wow – thanks, I’ve rarely been perfectly articulate but I suppose I had to get there eventually! Well if you’re not enjoying painting Praetorians then take a break – this is meant to be for fun after all :-) Looking forward to seeing your Khorne-tainted Wolves (naturally!) and your secret Ogren’s project (you had me at ‘it’s a secret’!) Keen to see those Rogue Trader Pirates as well. Keep ‘em coming and Happy Birthday! I’ll see what takes my fancy after holibobs!